Have you ever run a regression model in SAS but later realize that you forgot to specify an important option or run some statistical test? Or maybe you intended to generate a graph that visualizes the model, but you forgot? Years ago, your only option was to modify your program and rerun it. Current versions of SAS support a less painful alternative: you can use the STORE statement in many SAS/STAT procedures to save the model to an item store. You can then use the PLM procedure to perform many post-modeling analyses, including performing hypothesis tests, showing additional statistics, visualizing the model, and scoring the model on new data. This article shows four ways to use PROC PLM to obtain results from your regression model. You can use the SCORE statement to score the model on new data. You can use the EFFECTPLOT statement to visualize the model. You can use the ESTIMATE, LSMEANS, SLICE, and TEST statements to estimate parameters and perform hypothesis tests. You can use the SHOW statement to display statistical tables such as parameter estimates and fit statistics. For an introduction to PROC PLM, see "Introducing PROC PLM and Postfitting Analysis for Very General Linear Models" (Tobias and Cai, 2010). The documentation for the PLM procedure includes more information and examples. To use PROC PLM you must first use the STORE statement in a regression procedure to create an item store that summarizes the model. The following procedures support the STORE statement: GEE, GENMOD, GLIMMIX, GLM, GLMSELECT, LIFEREG, LOGISTIC, MIXED, ORTHOREG, PHREG, PROBIT, SURVEYLOGISTIC, SURVEYPHREG, and SURVEYREG. 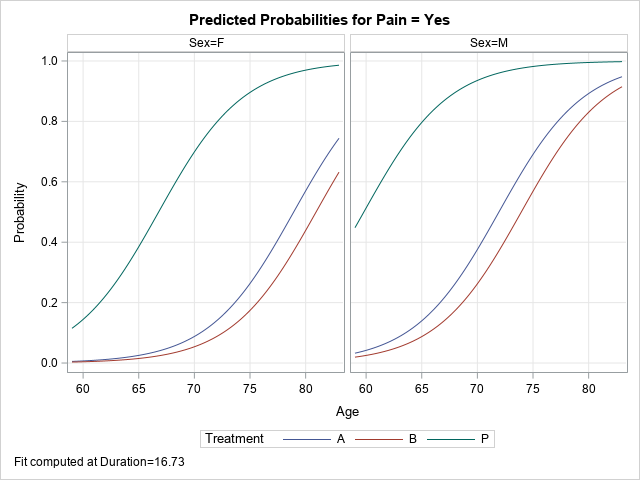 The example in this article uses PROC LOGISTIC to analyze data about pain management in elderly patients who have neuralgia. In the PROC LOGISTIC documentation, PROC LOGISTIC fits the model and performs all the post-fitting analyses and visualization. In the following program, PROC LOGIST fits the model and stores it to an item store named PainModel. In practice, you might want to store the model to a permanent libref (rather than WORK) so that you can access the model days or weeks later. The LOGISTIC procedure models the presence of pain based on a patient's medication (Drug A, Drug B, or placebo), gender, age, and duration of pain. After you fit the model and store it, you can use PROC PLM to perform all sorts of additional analyses, as shown in the subsequent sections. The output shows the predicted pain level for the three patients. The younger woman is predicted to have a low probability (0.01) of pain. The model predicts a moderate probability of pain (0.38) for the older woman. The model predicts a 64% chance that the man will experience pain. Notice that the PROC PLM statement does not use the original data. In fact, the procedure does not support a DATA= option but instead uses the RESTORE= option to read the item store. The PLM procedure cannot create plots or perform calculations that require the data because the data are not part of the item store. I've previously written about how to use the EFFECTPLOT statement to visualize regression models. The EFFECTPLOT statement has many options. However, because PROC PLM does not have access to the original data, the EFFECTPLOT statement in PROC PLM cannot add observations to the graphs. The graphs summarize the model. For both men and women, the probability of pain increases with age. At a given age, the probability of pain is lower for the non-placebo treatments, and the probability is slightly lower for the patients who use Drug B as compared to Drug A. These plots are shown at the mean value of the Duration variable. One of the main purposes of PROC PLM Is to perform postfit estimates and hypothesis tests. The simplest is a pairwise comparison that estimates the difference between two levels of a classification variable. For example, in the previous graph the probability curves for the Drug A and Drug B patients are close to each other. Is there a significant difference between the two effects? The following ESTIMATE statement estimates the (B vs A) effect. The EXP option exponentiates the estimate so that you can interpret the 'Exponentiated' column as the odds ratio between the drug treatments. The CL option adds confidence limits for the estimate of the odds ratio. The odds ratio contains 1, so you cannot conclude that Drug B is significantly more effective that Drug A at reducing pain. One of the more useful features of PROC PLM is that you can use the SHOW statement to display tables of statistics from the original analysis. If you want to see the ParameterEstimates table again, you can do that (SHOW PARAMETERS). You can even display statistics that you did not compute originally, such as an estimate of the covariance of the parameters (SHOW COVB). Lastly, if you have the item store but have forgotten what program you used to generate the model, you can display the program (SHOW PROGRAM). The following statements demonstrate the SHOW statement. The results are not shown. In summary, the STORE statement in many SAS/STAT procedures enables you to store various regression models into an item store. You can use PROC PLM to perform additional postfit analyses on the model, including scoring new data, visualizing the model, hypothesis testing, and (re)displaying additional statistics. This technique is especially useful for long-running models, but it is also useful for confidential data because the data are not needed for the postfit analyses.